Introducing a specialized cover stitch and chain stitch sewing machine that takes sewing up a notch. Cover stitch. Perfect for various applications such as simple hems, sleeve cuffs and necklines. Since the stitching stretches, it is ideal for stretch fabrics. Chain Stitch. Since the lower thread forms a chain on the wrong side of the fabric, the stitch is strong when it is stretched making it ideal for stitching the waist and side seams of pants. It also does well as decorative stitching for necklines. Presser Foot Lifter. The presser foot is higher as its tip in order to allow the fabric to be easily inserted at the start of sewing. In addition, raising the presser foot lifter to the first position raises the presser foot to 10mm. Adjustable differential feed - Adjust the differential feed to sew beautiful finishes, even with stretch fabrics such as knits and georgette. Simple looper threading - The looper can easily be threaded since it can be lowered at the press of a button. Extension plate with seam guide lines - The seam guide lines on the extension plate are a useful aid for sewing. Adjustable presser foot pressure - The presser foot pressure can be adjusted according to the type of fabric being sewn. Presser Foot with guide - A presser foot equipped with a guide that presses down on both the left and right sides is provided as a standard accessory. Exterior thread cutter - The exterior thread cutter is useful when removing the fabric after raising the presser foot at the end of sewing. US Warranty 5 year limited warranty on defects in materials and workmanship. 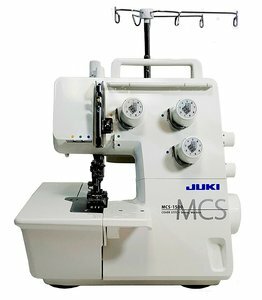 Introducing JUKI's new sewing machine specialized in cover stitching and chain stitching, the MCS-1500! In this video, we cover how to coverstitch.